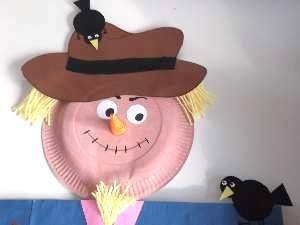 Do you have a friend to help you make this paper plate scarecrow? Old or young, it doesn`t really matter. Did you know? Adults amazingly transform into kids when asked to help in kid`s craft activities. There is quite a lot to do on this kool kids crafts project. It way take more than one session if you are doing the full model alone, so if you want to see the end results today, team up! To begin, let`s make the head. 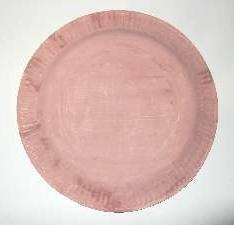 If you need to, paint your paper plate and leave to dry. It is best to paint it thin at first and then add a second coat. While it is drying make the hat. 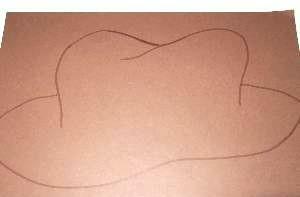 To make the hat look floppy, draw a peanut shape and then make a hump shape coming from the middle. This makes it look old and out of shape. Cut it out and either draw a black curvy band or cut one from black paper like I did. Here is how to make the straw. 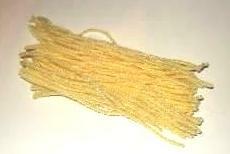 Wrap the yellow wool around your hand, take it off, and cut the loops at both ends to make short strands. Now separate the bunch into 2 equal amounts. 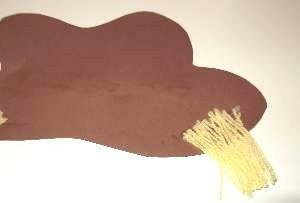 Turn the hat over to the back and paste glue at the bottom of both sides and press the wool on. Don`t fiddle with it too long or the wool will start to stick to your fingers. If your making your straw from paper, just cut half of the yellow A5 into thin, short strips and stick them on. Ok! 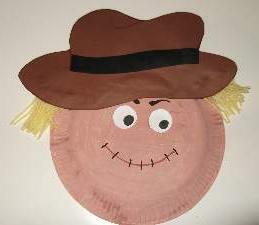 The paint should be dry so now you can complete the paper plate scarecrow. First cut 2 circles from the white paper and draw black circles in each but not in the center. Draw them off-center to make the scarecrow look in a specific direction. Draw the eyebrows making them thin to thick on the inside and pointing a little downwards. 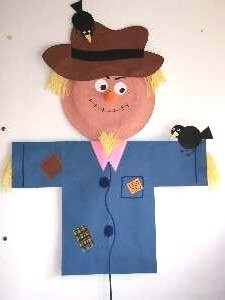 Not too much as our paper plate scarecrow is a friendly chap. The mouth is a line curving upwards with stitches along it. Apply paste to where the forehead will be and stick the hat on making sure that it`s facing the correct way. Cut a curve around one corner of the orange square. Paste a line of glue along one edge. 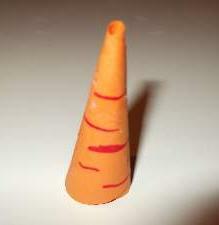 Now take the other edge and begin rolling it to make a cone shape. Stick the edge down and glue onto the face. The paper plate scarecrow head is finished. If you would like a bird on the hat, or would like to make the full version, download the instructions. They can be accessed by signing up to CraftsWork Newsletter and printable crafts. Are you crazy about paper plate crafts??? Then here are some more to keep you happy!